This is post number 2001 On An Overgrown Path. Which means that over the past five years more than half a million words, 5000 images and 4000 comments have been launched into cyberspace. My thanks go to my readers, not just for staying with me, but also for providing contributions and guidance. If the blog has achieved anything it is down to you, the readers. The problem is that we've already been inside of the machine and can see the gears pretty clearly. On An Overgrown Path has lasted for 2000 posts. But by Costa Gavras' reckoning I won't be blogging in 4009. Which is not a problem as I am sure there are still quite a few posts to come. Anyway, when all is said and done this blog is not about gears and machines; it is about what reader Charlie Foss described in a comment as "that most excellent gift - music". 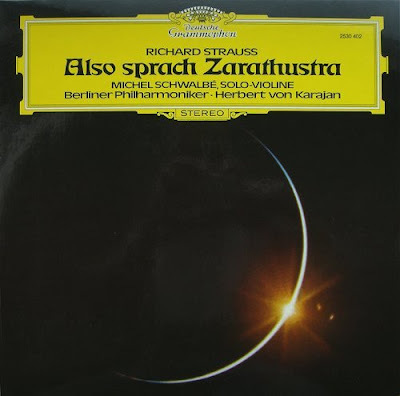 So, on this gloriously sunny May Day here in England, I'm putting that ravishing 1974 LP of Karajan and the Berlin Philharmonic playing Strauss on the turntable, and I'm going to enjoy a quiet celebration with friends. Why don't you join me? Congrats and looking forwards to the next 2000. I love your publication. You never know what's coming next. And congrats on the 2001 posts. Are you considering playing Ligeti's "Requiem" while you're at it?